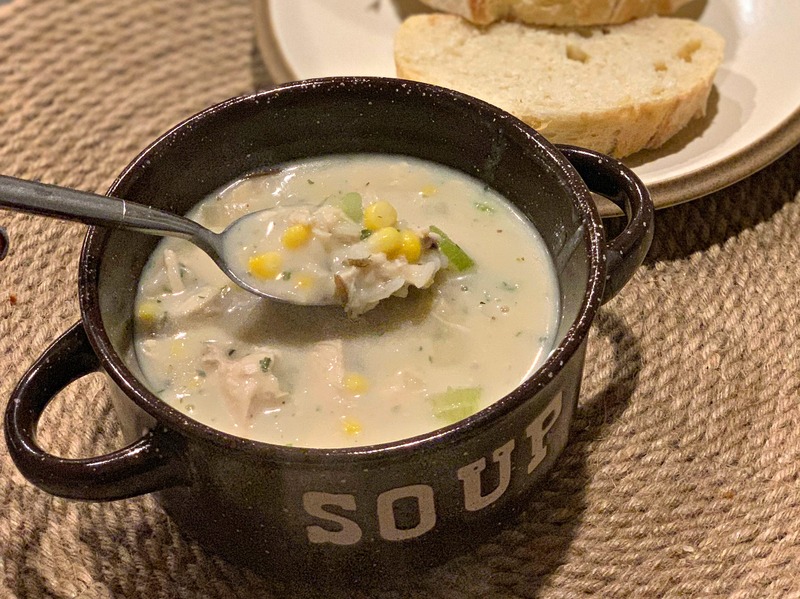 This Copycat Panera Chicken and Wild Rice Soup tastes just like the restaurant….only better! Simple, creamy, and flavorful, it will be a hit with everyone! Being Winter, I love adding new soup recipes to the meal plan. There is nothing better than enjoying a warm bowl of soup on a cold night, right? Well, last week, I prepped all the ingredients just before heading to pick up my kids from school. When we returned, I put it all together in less than ten minutes and moved on with homework help. I let this simmer until dinner, so it worked out great! I ended up pairing our soup with a loaf of crusty bread and side salad, but you could also serve fruit/veggies, just bread, or even by itself! Not only does this soup taste just like Panera’s (maybe even a bit better, hehe), but all three of my kids gave this two thumbs up. That’s big news as I have picky eaters! This made enough for us to enjoy the next evening for dinner, and then a lunch serving for my hubby to bring to work a few days later! If you aren’t cooking for many people, simply freeze the leftovers for another day! 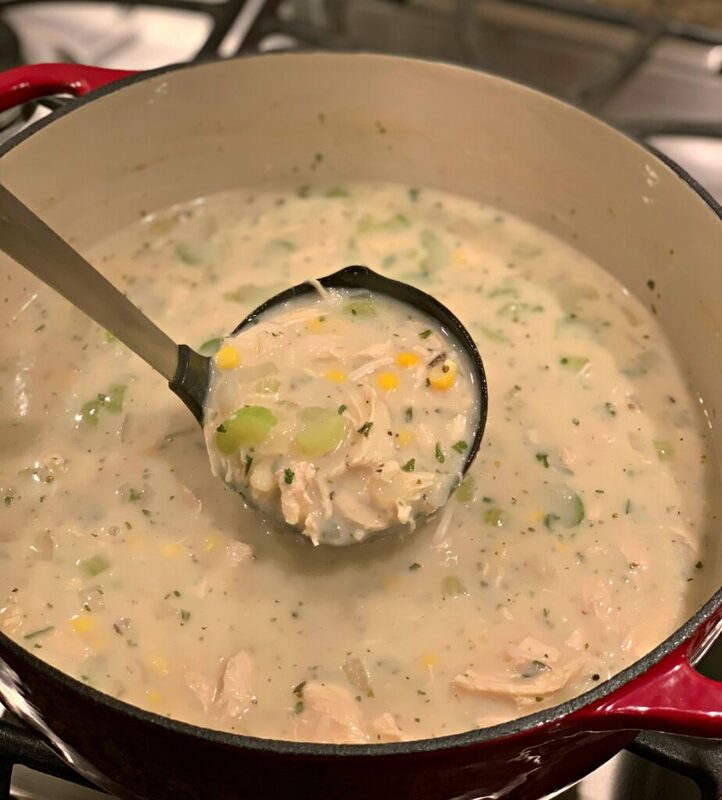 This soup is packed with the perfect amount of chicken, veggies, and rice….all in a creamy broth! Hope you enjoy! Be sure to let me know how it turns out! 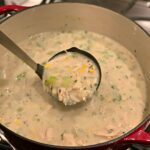 Simple to make, packed with flavor, and only requiring simple ingredients....this soup comes together in no time! In a large pot (I use a Dutch Oven), add the celery, corn, onion, and olive oil. Allow to saute over medium heat for about 5 minutes, or until tender. Add in the minced garlic, chicken broth, water, and 1 cup milk. Mix to combine. Add in the pepper, oregano, bay leaf, and shredded chicken. Allow mixture to simmer over low heat for about 15 minutes. In a small bowl, combine the remaining 1 cup milk with the flour. Whisk until free of clumps. Pour mixture into the soup and whisk until combined. Add the box of rice, including the seasoning packet, and mix well. Allow mixture to simmer for about 20 minutes, or until rice is tender. Adjust flavor with desired amount of salt and pepper.